This page offers for sale FD lenses that have been fully and professionally Lens Doctor converted to EOS fitting. They also have been fully refurbished to a very high standard. The lenses displayed within this page contain and describe all relevant information in the listing as to what EOS Camera they mount and operate on. Most fit both EF & EF-s, if they are EF-s alone this will be highlighted in RED within the lens description. All are re-collimated and calibrated to their New EOS mount and precision, fine tuned to maximise the absolute peak of their performance and matched to the corresponding indications on the lens index. The FD to EF Lenses for sale below begin with the 17mm variant and run through to the 300mm. The lenses that we have for sale also consist of many L grade versions and of course zooms, which we have in stock. Above the 300mm, please visit Long Range lenses page on this site, here is the :link ( click here), and if there are any long range lenses for sale they will be contained within this page listing. LENS DESCRIPTION: Despite its fast speed and other strong features, the 20mm remains compact and light weight for utmost portability. It is an very interesting lens and often underrated by many photographers mainly due to its first exaggeration of perspective as compared with the common wide angle vision of 28mm or 35mm. This lens is perhaps the first lens that actually portrays a feel of the exciting world of Ultra-wide angle photography. In other words, you have to see the image produced by such a focal length through the SLR's viewfinder to see what I meant. Its most significant difference, however, is a maximum aperture of f2.8, one stop faster than that of the 17mm which at times can be of significant difference for available light photography. LENS DESCRIPTION: This is the widest of the wide-angles and though just a small step away from the super wide-angle lenses, it's a lot easier to use. Second, there's a strong rendition of perspective that can be controlled quite easily. It's also a focal length that is growing in popularity with non-professional as well as professional photographers. LENS DESCRIPTION: A very appealing lens blending good lens speed and a compact design. Using high refraction glass for improved optical performance. Alternating four convex and concave lenses in the front lens group serves to curb distortion, astigmatism and coma. The use of the floating system also aimed to maintain high quality pictures even at its closest focusing distance of 30cm, Compared to the earlier original FD 28mm f/2.0 lens, this lens is 24 percent shorter in overall length and 23 percent lighter. LENS DESCRIPTION: Among the many primary features that can be found in standard 50mm lenses, the top of the list is their large maximum apertures. Used with high ISO film, these lenses can handle virtually any light level. The UD element used in the Canon New FD f/1.2 was utilized to eliminate flare that is quite common with fast lenses at the maximum aperture. An additional characteristic of fast lenses is the shallow depth of field that can be obtained when the lens is used at the maximum aperture. When the aperture is large, the foreground and background become blurred, isolating and emphasizing the main subject. The differences between the minimum and maximum apertures of these two old and new FD 50mm UD lenses are very large which allows you to have a lot of control whether the depth of field should be kept deep or shallow .Instead of assuming that the standard lens can only take normal pictures, we should explore its possibilities further. Always think of it as a short telephoto lens. Since it is the only lens which lies between the two types between wide angles and telephoto lenses. LENS DESCRIPTION:The 100mm is perhaps the first telephoto where the difference in image size on Photograph becomes apparent. While there is some perspective compression it's not overpowering. And this could be the reason why a photographer that is used to the "ordinary" view of a 50mm lens, finds it to be very appealing when he/she is to view through the eyepiece with the 100mm focal length for the first time. However, the depth-of-field of the 100mm lens is substantially less than that of the 50mm lens at the same focusing distance and aperture which contributes to a very pleasing visual when compared with lenses of standard focal lengths. LENS DESCRIPTION: As you moved up the focal length scales, you will see an increase in compression of perspective, a narrowing of the angle of view, increased magnification of the image and a decrease in depth-of-field. You won't see these changes to any great extent with the 85mm and l00mm lenses. But they become more apparent with the 135mm. The basis for classification of lenses, in addition to angle of view, is the extent to which they magnify the image you see in the finder. Well, for many still prefer and believe in edge of superiority of the built and optical quality of prime lenses over zoom lenses, these lenses, although they may not present the conveniences of modern zoom lenses, still presents a very attractive alternative. LENS DESCRIPTION:A high performance telephoto lens well suited for stage, portraiture photography and travel, sports or documentary work. This lens incorporates glass with a higher index of refraction and boasts a lens composition of seven air-spaced elements. With the employment of the Rear-group focusing system, focusing is smooth and easy and lens balance is maintained. Looking through the viewfinder with a 200mm lens attached to your camera for the first time is an exciting experience. With magnification that fills the 35mm frame with an area 1/16th of that covered by a 50mm lens, the 200mm figuratively reaches out to create eye-arresting images. With a diagonal angle of view of only 12", it is an extremely versatile lens. One of the bigger advantages is the comfortable working distance over the subject you are shooting that it provides. LENS DESCRIPTION: The 200mm Macro can focus from a life-size image magnification ratio (1:1) to infinity without any additional attachments. Numbers indicating the magnification ratios are engraved in yellow on the lens barrel so it is easy to see where 1:2 and other magnifications are. Further, the adoption of a two group focusing system in the 200mm Macro lens has reduced barrel extension to a minimum although one would expect an optimum solution with optical solution such as Internal Focusing system be employed for non extension or rotation of the lens barrel. The maximum extension in this case is 38.6mm for recording images at life-size magnification. Things to note is generally, long focal length of macro 200mm lens as compared with the shorter ones, the depth of field is extremely shallow and hence requiring careful attention to focusing and precautions against camera movement. Thus, as a rough rule of thumb, the smaller the extension of the lens barrel and the less camera balance is upset, the better. Use of a cable release or in combination with a mono-pod or a tripod is recommended whenever shooting close up with this lens. LENS DESCRIPTION: This lens covers the most frequently used focal lengths and with its zoom ratio of 3, rivals the excellent standard zooms. Canon uses three group zooming system optimally corrects all aberrations and allows light weight, compact construction. A built-in movable flare-stopper minimises undesirable incident rays to maintain flare-free excellent optical performance.The built-in macro capability permits close-up photography over the entire zoom range. A minimum film-to-subject shooting distance of 50mm is possible at the short telephoto extremity of 85mm (with a magnification ratio of 0.2X). Constant aperture of f4.0 is maintained throughout the zoom range. A substantial conversion producing outstanding life like colour on digital. LENS DESCRIPTION: This lens came from a time when Canon were experimenting with Aspherical glass built into plastic moulds, there were 3 lenses that were introduced with Aspherical glass this being one of them. The lens on digital is Brutally sharp with inky black colour and contract..As indicated the Aspherical glass in this model should have rendered the model as L grade. This lens will not disappoint even the stringent scrutinising photographer. LENS DESCRIPTION: One of the best options among the few alternatives within the 300mm focal length. Two ultra low-dispersion glass elements used in this lens correct chromatic aberration and substantially reduce the secondary spectrum. Excellent on digital format,producing spectacular images, a lens to select for sports wildlife and general distance work .. One you will never be disappointed in and always a pleasure to work with, tripod mounted produces the best results. LENS DESCRIPTION: The New FD 35mm f/2 and the New FD 35mm f/2.8 are good choices to cover parties, anniversaries or weddings, provided you are happy to work with only a few people in the picture or compromise for working distance when used with flash. However, if you need broader than this angle of view to cover a small group of people, like a night group photo of six or seven persons in a confined space, I would suggest you to select the 28mm version instead. Basically, the 35mm focal length is better suited to cover 3-4 persons from a normal distance when used along with flash. It has the added advantage to have a more natural perspective than lenses of 28mm or shorter. A rational lens composition counters spherical aberration, especially common at full aperture. Canon's Floating System was used to maintain high performance from its closest focusing distance of 0.3 meter to infinity. Its speed, portability and natural perspective make it a popular lens with virtually unlimited applications. LENS DESCRIPTION: With its pleasing perspective, the 85mm has long been considered an ideal focal length for portraiture where depth of field plays an important role. Thus stress was placed on enhancing this lens' full aperture capabilities. Sharpness increases at smaller apertures should also produce overall crisp results. These sharp lenses compressed the space in front of and behind the main subject, making everything seem much closer together. Canon's superb telephotos are specifically designed for photography of especially difficult subjects. Telephoto lenses have a narrower angle of view and shallow depth-of-field. They produce flattened perspective which makes them useful in portrait photography. They have high resolving power to keep the image perfectly sharp from the centre all the way out to the edges of the frame. And because Canon telephotos are treated with the unique Super Spectra coating, chromatic aberration and astigmatism are reduced to an absolute minimum. LENS DESCRIPTION:The 85mm focal length bridges the gap between standard and telephoto lenses. Its 29° angle of view isn't substantially narrower than the standard lens. However, many photographers rely on the 85mm lens for a variety of photographic situations where camera-to-subject distance is relatively short and where they need tightly framed coverage of the image area. In addition, the effect of compressed perspective typical of telephoto lenses is at its minimum with the 85mm lens. Many photographers choose it for portraiture. Because the slight distant provides with its extended focal length lessen the effect of distortion over facial features. With a 50mm lens you may have to shoot as close as three feet (or about one meter) to the subject in order to fill the frame, other than the distorting factors, it may also cause your subject to become camera conscious and that could result in less desirable or unnatural expression due to the close working distance. Because of its very slight flattening of perspective, telephoto lenses tends to reproduce facial features in a natural way. In addition, the slightly greater camera-to-subject distance helps the subject to relax. The result is a technically more pleasing portrait that is more likely to reflect the personality of the subject. The nature of the 85mm lenses, while avoiding both extreme compressive effects and perspective, can emphasize and isolate the details in action shots or any given particular scene.The perspective of short telephoto lenses (60-85mm) is closest to that of the human eye. These lenses cause very little distortions when shooting close-ups of people's faces and also secure comfortable working distance between the camera and the subject. LENS DESCRIPTION: One of the 'Star Performer's lens within the FD series of optics is this New FD 24mm f/1.4L lens - it is still one of the fastest lenses in wide-angle lens with its only competitor being the auto-focus version of the EF lens. It was also Canon's answer to many photojournalists' request on a lack of a high speed and high performance lens, of which the 24mm focal length is usually their favourite for news coverage and photojournalism. Creating a lens of such high speed may not pose any problem with the FD's wider than normal lens mount, but making it comes with a top rated optical performance is another. An Aspherical lens was used as the front element to achieve high sharpness and high resolving power. It is also this Aspherical element that sets it apart from other wide-angle lenses. One of the most difficult colour situations is an outdoor scene at night lit by unshielded tungsten lamps. With ordinary lenses you can expect a noticeable degree of color fringing, with a consequent loss of sharpness and proper colour. The FD 24mm f/1.4L not only has great light gathering power but its Aspherical element enables superb colour even under the most difficult conditions. Best used under a wide range of light conditions and promises brilliant images regardless of the shooting situation. LENS DESCRIPTION: The 300mm is one of the most popular focal lengths with professional and serious amateurs. It provides tremendous image magnification but is still comparatively small (other than the biggie of the f2.8 version) and lightweight, making it easy to handle. In addition, the 300mm focuses close enough to be an extremely flexible lens, With the New FD 300mm f/5.6, you can focus from as close as 3 meters (10 ft.). The effect of compressed perspective and shallow depth-of-field is even greater with the 300mm compared with shorter focal length of telephoto lenses. This adds to your ability to control the appearance of the final image. The 300mm is a good choice for sports, nature, news and even fashion photography. Compared with a wide-angle lens that covers a tremendous-subject area, the 300mm lens reaches out to magnify the subject and at the same time eliminates distracting elements in the photograph. 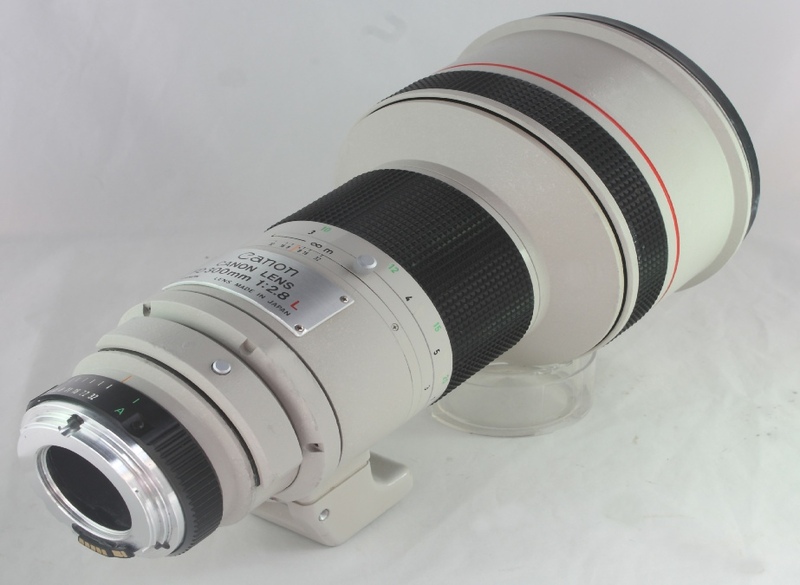 LENS DESCRIPTION: This FD 85-300 mm f/4.5 zoom lens is an improved version of a proven optical design (Inherited from the earlier FL 85-300mm F5 zoom), offering an incredible range in a lens that is less than ten inches long. As compared with the earlier FL mount, the FD version has a better mounting system which allows the lens to be attached to the camera with a simple bayonet-type twisting action with one hand. A friction lock has been provided for the lens hood, and an improved, removable tripod mount has also been incorporated. Special efforts were made to correct spherical aberration and coma, resulting in high contrast across the whole focal length range and excellent resolution capabilities. The double ring control system with separate rings for focusing and zooming has been employed and an improvement in the direction of rotation has been made. LENS DESCRIPTION: The high performances of the 300 series lenses usually equates with high prices, however, this lens was designed with cost efficiency as a top priority. Attractive features include - minimal spectral aberrations, due to fluorite and UD glass elements (1 each), a high magnification, 3X zoom, and a built-in macro mechanism, for macro photography from 1 meter (0.3X magnification).This lens has a single push/pull type zoom and focus ring, and employs the mechanical compensation system.Its closest focusing distance is 2 m (6.6 ft.), which is an improvement over the 2.5 m (8 ft.) minimum focusing distance for the F 85 - 300 mm f/4.5 lens. Aberration correction is maintained by increasing the focal magnification (decreasing the overall length) and by using a new compensation lens system, as well as with a special correction lens in the second group of the relay. The focusing ring has a different textured than earlier version, please adjust your pricing for the new and older version when trying to source for one in the used market. LENS DESCRIPTION: This lens, introduced in mid of 1982 as the first super zoom with a high zoom ratio of 6X covers the frequently used focal length range from standard 50mm to telephoto 300mm. It is easy to operate and has a maximum aperture of f/4.5 which is quite fast for its class. The use of Canon’s original 4-group zoom optical system and UD glass lens element featuring low dispersion and low index of refraction offers correction of aberrations and excellent definition in all ranges despite being a high magnification zoom lens with a focal length of 300mm. This lens combines the advantages of a normal, portrait, telephoto and long telephoto focal lengths, and comes with a reasonable speed for its zoom range. Although in films or on television, lenses with zoom ratios of 10 or more are used to create impressive zoom effects. But an increase in the zoom ratio means loss of brightness and a deterioration of image quality. Therefore, the zoom ratio is usually limit to 2 or 3 with ordinary still photography lenses. The lens featured here, however, boast an unusually high zoom ratio of 6x and was also the first of its kind to use internal focusing. The 50-300mm f4.5 L was Canon's eventual answer to frequent requests from professional photographers to demand a similar class of high performance zoom lens, although this lens has long been available in Nikon's Nikkor line-up, but Canon has all the while an 85-300mm f4.5 to answer that challenge. The FD 50-300mm f4.5 L lens was boosted with two UD glass to correct the secondary spectrum and thus achieving high optical performance despite its high zoom ratio and with such a complex optical construction within. LENS DESCRIPTION: Within the focal length of Canon 300mm lenses, there are two that are classified as ultra high-performance lenses, including one with a fluorite element as well as UD glass and the other with " UD " (Ultra-Low Dispersion" or called "ED" (Extra-Low Dispersion) or "SD" (Super-Low dispersions by many other optical glass manufacturers) glass. Both types provide images unusually free from chromatic aberration that often affects the performance of long focal length lenses. To understand the difference between the fluorite and UD elements and conventional lenses, let's recall what happens when light passes through a prism and is split into seven colours. The difference in the refraction index results in dispersion of the various wavelengths as light passes through a lens. As previously discussed in many forums and journals, this is called "chromatic aberration ". In practical terms it adds up to loss of image sharpness. Designers solve this problem of chromatic aberration by using various types of glass. The glass has to be made to extremely critical refractive indexes while also having low dispersion. Using conventional optical glass, designers can correct chromatic aberration only to a certain extent. There remains a residual colour error called the secondary spectrum. With optical glass, this secondary spectrum cannot be reduced beyond 0.002mm times the focal length. Thus, secondary spectrum becomes a serious problem as focal length increases. Lens designers are constantly at work to produce raw materials and new designs resulting in optical glass with lower refractive indexes and abnormally low dispersion. "Artificially" grown fluorite crystals derived from calcium fluoride are an outgrowth of Canon research. Canon was the first lens manufacturer to eliminate secondary spectrum by employing this element in the FD 300mm f/2.8L and FD 300mm f/4.0L lenses. Please note that we no longer supply AF confirm chips to any of our converted lenses as standard, due to the various AF chips that are now available, that match manufacturers software releases. We can still supply and fit AF chips if required, but these will be provided at an additional cost dependant on AF chip required. Please enquire when ordering a converted lens.